If you’ve got the engine leaking oil in your car, it’s important to understand the dangers of continuing to drive with that engine oil leak. Even if you’re the most conscientious of drivers, it can be easy to forget to check your oil levels when you’re late for work. Similarly, if you’re currently driving with an oil leak then you probably are checking your oil level as often as the leak rate leaves you with a low level. If the leak rate suddenly increases, you could end up with a low oil level without warning. 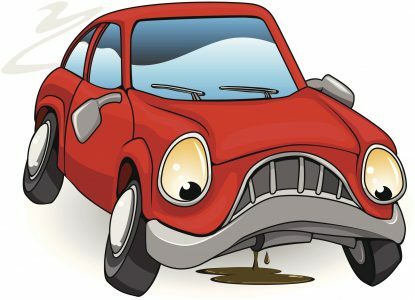 Having a low oil level in your engine due to an engine oil leak is one of the quickest ways to cause catastrophic engine damage. The oil in your engine lubricates and cools the components as they rotate and move. The pistons in your engine travel at incredible speeds and can get hot very quickly due to the combustion process and friction. Similarly, your crankshaft and camshaft are spinning inside bearings and without oil to float on they will make contact with the bearings surface and quickly get hot enough to melt the metal. Hopefully, this helps prove the urgency of stopping an oil leak to make sure your engine doesn’t run low on oil. Checking the oil level regularly in hopes that you keep the level topped off just isn’t worth the risk of the type of damage that may be done if you let the oil level drop too low. To keep your engine running safely with plenty of oil, it’s important to stop any engine oil leaks you may know about or find. The first step to stopping an engine oil leak is tracking down the source. There are many ways to find where your leak may be coming from. A visual inspection of your engine can definitely help you find the leak if you know what you’re looking for and if your leak is big enough to leave a wet oil trail. If you’re inspecting your engine for an oil leak always make sure to trace the leak up to its highest point on the engine to be sure you’ve pinpointed to actual leak location, not just part of the trail. You can also try adding UV dye to your engine oil, driving a short distance, then checking your engine bay with a UV light. This method is similar to a normal visual inspection but is often much more accurate and much faster. Once you’ve located your leak, you have to decide what the best course of action is for sealing it. If you find the leak in an easy to access area, like your valve cover gasket, then it may be worth replacing the gasket yourself. If you discover the leak coming from a difficult to access area, like your timing cover or a camshaft seal, it is much easier to use BlueDevil Oil Stop Leak to seal up the leak and keep your engine safe. BlueDevil Oil Stop Leak is safe to add to your engine oil and leave in until your next oil change. BlueDevil Oil Stop Leak will restore the seals and gaskets in your engine to their original shape and size sealing the oil leak and keeping you from having to check your oil level every day. For more information about BlueDevil Oil Stop Leak, including how simple it is to use, click on the banner below! Unfortunately, we do not have any distributors in Papua, New Guinea, however, you can purchase the product directly on our website, http://store.gobdp.com/oil-stop-leak-49499/. Simply add the item to your “cart,” enter your billing and shipping information, and your order total would be calculated at checkout. Great job! Engine leak is the major problem for every vehicle owner, even I also faced this problem with my car and search for lots of tips and this is the best result in my search. I thank the author for sharing the tips to avoid engine leakage. Radiator Replacement Cost — How to Stop an Automatic Transmission Leak?